Grosvenor House Dubai is a luxurious property housed in two iconic 45-story towers – Tower One and Tower Two – famous landmarks on the Dubai Marina. 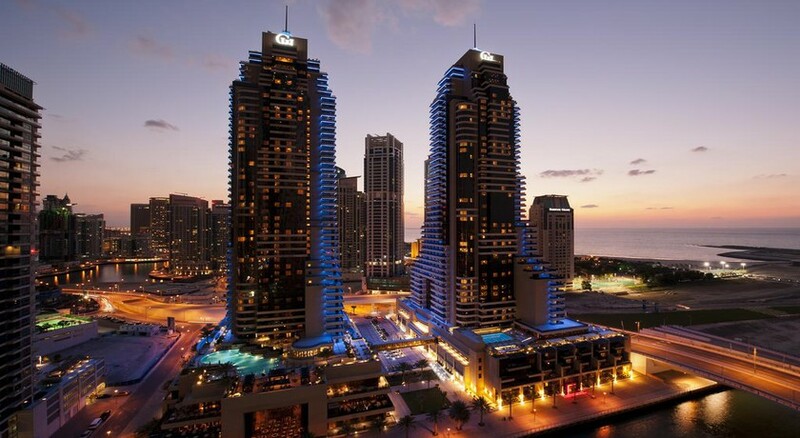 With its 750 contemporary guest rooms, suites and apartments offering fabulous sea views and world-class hospitality, Grosvenor House offers a comfortable stay in Dubai for families, couples and friends. Signature Luxury Collection beds, floor-to-ceiling windows overlooking the marina and first-class amenities make the hotels deluxe rooms and suites a tranquil place to unwind, relax, or get ready for an exciting day in the city. Grosvenor House Dubai has over ten fantastic restaurants and bars, a rejuvenating spa in each tower, free access to beach and pool facilities at Le Royal Meridien Beach Resort and a medley of popular attractions within walking distance – including Dubai Zoo, Palm Jumeirah, Emirates Golf Club and Dubai Internet City and Media City. Located close to the beach, the Grosvenor House Dubai is moments from most of the city's top tourist and shopping attractions. The Beach Mall is a 10-minute walk away, while the Emirates Golf Club is a 5-minute drive away. You can reach the World Trade Centre and the Dubai Mall in just 20 minutes. The Dubai International Airport is a 30 minutes’ car ride away. Grosvenor House has 749 rooms, suites and apartments housed in two opulent towers, all elegantly furnished with modern amenities. The guest rooms are available in various categories including Deluxe Rooms, Superior Deluxe Rooms, Deluxe Suites and Premier Rooms and can sleep 2-3 guests. 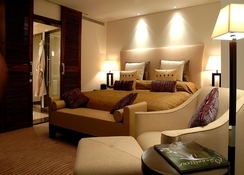 There are also fully furnished, serviced apartments that can accommodate up to 5 guests. The rooms have 42-inch flat-screen TVs and floor-to-ceiling windows. The marble bathrooms are equipped with Bvlgari amenities, a soaking tub and rain shower. Balcony and Club lounge access is available for few rooms. 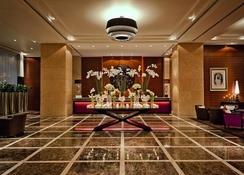 Grosvenor House Dubai offers one of the best dining experiences in Dubai. 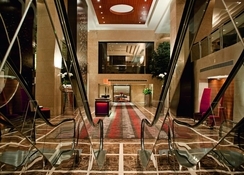 The hotel has more than ten amazing restaurants and bars that offer delicious fare. Try Latin American cuisine at Toro Toro, Mediterranean food at Siddharta Lounge By Buddha Bar, Indian delights at Indego By Vineet, Turkish cuisine at Ruya and everything Asian at Buddha-Bar. There’s a weekly seafood buffet at Sloane’s, while Bar 44 on the roof offers excellent panoramic views of the Dubai Marina to be enjoyed over snacks and cocktails.